Fatty acids are a carboxylic acid with a long unbranched aliphatic tail (chain), which is either saturated or unsaturated. Fatty acids derived from natural fats and oils may be assumed to have at least 8 carbon atoms. ost of the natural fatty acids have an even number of carbon atoms, because their biosynthesis involves acetyl-CoA, a coenzyme carrying a two-carbon-atom group. Saturated fatty acids do not contain any double bonds or other functional groups along the chain. The term "saturated" refers to hydrogen, in that all carbons (apart from the carboxylic acid [-COOH] group) contain as many hydrogens as possible. Saturated fatty acids form straight chains and, as a result, can be packed together very tightly, allowing living organisms to store chemical energy very densely. The fatty tissues of animals contain large amounts of long-chain saturated fatty acids. The human body can produce all but two of the fatty acids it needs. These two, linoleic acid (LA) and alpha-linolenic acid (LNA), are widely distributed in plant oils. In addition, fish oils contain the longer-chain omega-3 fatty acids eicosapentaenoic acid (EPA) and docosahexaenoic acid (DHA). Since they cannot be made in the body from other substrates and must be supplied in food, they are called essential fatty acids. 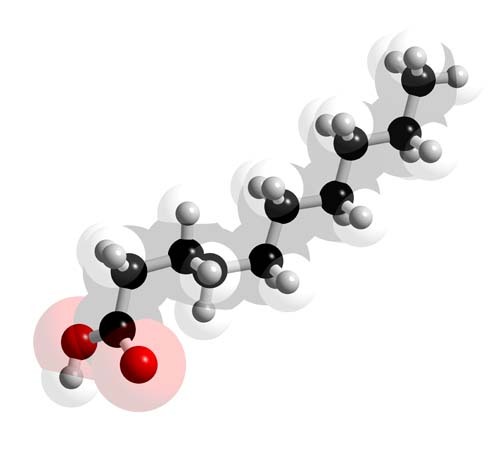 Mammals lack the ability to introduce double bonds in fatty acids beyond carbon 9 and 10.Hence linoleic acid and linoleinic acid are essential fatty acids for humans. In the body, essential fatty acids are primarily used to produce hormone-like substances that regulate a wide range of functions, including blood pressure, blood clotting, blood lipid levels, the immune response, and the inflammation response to injury infection.